We’re still nearly two weeks out from the start of the regular season and spring training seems to be boiling down to two major issues: the last two spots in the rotation and who will be the fifth outfielder. Wednesday night’s game was on ROOTSSports and it sure was fun to watch six innings before I dragged myself off to bed. At that time the M’s had just tied the Giants 3-3 and it was pretty exciting stuff. The M’s have had a great spring, have a good record and have thwacked the ball pretty well. Mike Morse leads the Cactus League in homers and Kendrys Morales had another dinger last night. I know it’s only spring training, but that is what they got those guys for, so it’s good to see them serving that purpose. The most fun I had watching the game, however, was checking out Brad Miller and Nick Franklin. They both played hard, gritty baseball with good defense, stealing bases, and driving in runs. I hope they both end up in Tacoma because I’m convinced they could be the M’s double play combo of the near future. Watched Brandon Maurer pitch pretty well last night, and Tom Wilhelmson explode like a compressed gas can. Maurer’s been good and is in the running for the fifth spot in the Mariners’s rotation. Geoff Baker made an interesting observation about Maurer yesterday that he has been good this spring, but not so good that he couldn’t be sent to Tacoma to start the year. He considered the case of Michael Pineda in 2011 when he was clearly pitching better than anyone but Felix and he literally couldn’t be kept off the team less there be a player mutiny. Maurer has been good but not that good. Which brings us to the remaining candidate for those rotation spots. They likely will be veteran Jon Garland, and youngsters Erasmo Ramirez and Blake Beavan. In my view, unless he is just ghastly his last couple of starts, Garland makes the team. He struggled in his last performance, but he’s throwing hard and generally doing what Jon Garland does, providing quality innings that may be a bridge to a younger pitcher later in the summer. Maybe Ramirez or Beavan, maybe one of the Fantastic Four, as they’ve taken to calling themselves. Choosing between Ramirez and Beavan is a tough one. All the SABR guys like Ramirez best. I’m not sure I have a strong view based on metrics or otherwise. What I will say is that it’s difficult to get stuck on last year’s statistics for a young pitcher who is 22 or 23 years old. 1) neither has sprung fully formed onto the scene, guns blazing, like Doc Gooden, 2) neither have much major league experience, 3) it’s silly to think they aren’t working on their game and aren’t going to be different, hopefully better than last year. Either Ramirez or Beavan will make decent number five guys, and the other will provide organizational depth when the rotation suffers inevitable injuries. Honestly, I think the outfield situation is a more pressing one. 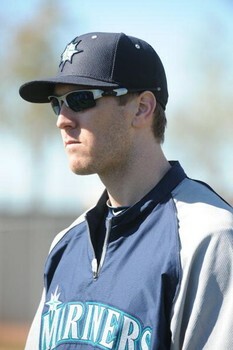 The Mariners have to decide whether their fifth outfielder will be Jason Bay or Casper Wells. Wells has admittedly been a disappointment. He hasn’t shown the kind of hitting necessary to move him into a starting role. Even so the M’s are looking at beginning the season with Franklin Gutierrez starting in center. Look I’m a huge believe in his ability, but Gutierrez is the man of glass, an injury waiting to happen. Not only is Gutierrez injury-prone, but his recoveries the last three seasons have been long. If Guti can’t play that means Michael Saunders is your center fielder. Saunders can definitely play, but if his sojourn in center is lengthy, who spells him? Who plays center if Saunders is hurt? Tonight Jason Bay is getting a look in center field. I shudder to think what this may look like, but clearly it indicates the M’s are seriously considering Bay over Wells who can play all the outfield positions. The Mariners will carry five outfielders. Four will certainly be Gutierrez, Saunders, Michael Morse and Raul Ibanez. Bay and Wells are vying for the final spot. What do the Mariners do? Bay has had very good spring, hitting the ball hard and playing better than expected defense. If the M’s roll the dice on Bay, how much of a chance are they taking without a handy centerfielder. Jason Bay future centerfielder? He’s playing there tonight. I told ’em. They should have signed Michael Bourn. I went to the M’s second home game last year on April 15th, Mariners vs. A’s. The team looked a lot different than it does this season. Franklin Gutierrez tore a pectoral muscle in spring training. The outfield that night was Casper Wells in left, Chone Figgins in center, and Ichiro Suzuki in right. Only Wells remains on the team, and the likelihood of him breaking camp with this team is iffy. Jesus Montero was the starting catcher and Miguel Olivo DH’ed. The infield was Liddi, Ryan, Ackley, and Smoak from left to right. The Mariners won 4-0 on Montero’s first home run in Seattle. It was a blast that cleared the center field wall. He also had a double. Figgins also had a hit, but played a timid looking center field, seemingly afraid to move in front of the much larger Wells. The starting pitcher that night was Hector Noesi. He looked great, shutting out the A’s over eight innings, striking out six and walking one. The A’s looked bad. At the time the M’s were ahead of the A’s by a half game, and Oakland seemed lost. Noesi looked like another budding young pitcher in the M”s system. But in baseball things are not all they seem. Fast forward to July. Noesi, his record now 2-11, optioned to Tacoma on July 5th is starting for the Rainiers. I accompany David to his awesome seats at Cheney Stadium. It’s a weekend day game and Hector Noesi is starting. We leave at the end of five with the Rainiers down 9-3 or something ridiculous. Noesi has been lifted for someone nearly as terrible. Noesi was part of Michael Pineda trade that also brought over Jesus Montero. If there’s any irony in this at all, it’s that Noesi has two more wins than Pineda who is still recovering from labrum surgery. It became clear last year that Noesi was basically a two pitch guy, and if he was going to make it back to the bigs as as starter he’d need an off speed pitch. Fast forward to spring training. The Mariners have recently signed Joe Saunders to join their starting rotation with Felix Hernandez and Hisashi Iwakuma. Jeremy Bonderman and Jon Garland have scrambled into the picture from the spare parts boxes trying to resurrect their careers from serious arm injuries, and the Gang of Three (plus one or two depending on you count ’em) are showing their stuff. Blake Beavan, Erasmo Ramirez and Hector Noesi are all mentioned in the same breath as competing with the others for the two remaining spots in the rotation. It’s gonna be hard but you give it your best shot. At the present time Noesi has a 14..73 ERA and a WHIP of 4.54. This is not a way to impress your friends, teammates, and coaches during spring training. Clearly Noesi’s off-speed pitch either isn’t being used, isn’t fully developed or doesn’t exist at the present time. I’m not trying to be overly negative. I don’t think Noesi should be tossed from the team plane at 30,000 ft.. But I am just mystified. How could a young pitcher with so much riding on developing a third pitch be so unprepared for the competition he was certain to face? I know in the spring pitchers are working on things. Established pitchers with a successful track records can work on a new pitch and look undistinguished, but Noesi’s track record isn’t the same as Felix Hernandez or even Jon Garland. I wish Hector Noesi well, but geez things sure seem to have come off the rails. When I was a kid, television was filled with westerns. Shows like Gunsmoke, Rawhide, Bonanza, and my favorite, Have Gun Will Travel were the chief entertainment on T.V. The heroes and villains almost always wore a gun belt for their .45 Peacemakers, and it was strictly the quick and the dead. Some wore two pistols. It’s always best to be prepared, especially if you can shoot from both sides of the plate. The gunfighters, whether good or bad, almost always had something else on their gun belt-a row of extra bullets that surrounded their waist-just in case they got in a tight spot and had to keep shooting. Aside from the incredible success I’ve seen from the M’s during spring training, what’s excited me most is the number of bullets-developing players- the team has that are really showing off their talent this spring. This doesn’t mean I believe they’ll be stars or even make the major league team this year or any other year. However, there are a bunch of young guys who are having a quality major league camp. This hasn’t always been the case. The last few years there’s been very little to get excited about. Some of the players are usual suspects-guys we’ve heard a lot about-highly drafted players like Taijuan Walker, Danny Hultzen and Mike Zunino. These are players we expect to see in the big leagues sooner rather than later. Other players who have contributed this spring we’ve heard less about. Ryan Divish of the News Tribune has a nice article this morning about catcher John Hicks. Though Hicks will likely start the year at AA Jackson, he’s another young player knocking on the door who will provide organizational depth at a position that’s been pretty barren since Dan Wilson retired. Shortstop Brad Miller is another player coming up behind Dustin Ackley and highly regarded prospect Nick Franklin that will push the guys in front of them and provide more depth if either falter. Logan Bawcom and Danny Farquar are two pitchers out of the bullpen there weren’t a lot of expectations for, but have had some nice outings this spring. Farquar came over in the Ichiro trade last summer, while Bawcom was one of the young guys the M’s got from the Dodgers for Brandon League. Though the M’s haven’t been very good, especially the past few years, they have been lucky. With the exception of Franklin Gutierrez, they’ve had few major injuries. Not that they’ve been good enough so you’d notice if they had. This year the Mariners have a chance to be better. It’s really important, especially if Seattle stumbles into some kind of race, they have the kind of depth that allows them to replace injured players with someone at least competent to step into a major league role if need be. From this standpoint it’s great to see the M’s have some good young players that will push one another for a shot at a major league roster spot. The bullets aren’t ready to loaded into the Peacemaker yet, but it’s good to see them on the belt, shining and ready for future action. It’s early in spring training. The M’s won their eighth game in nine tries today, clubbing the Dodgers 9-5. The games have been filled with power displays by Justin Smoak, Franklin Gutierrez, and Carlos Peguero. Even Brendan Ryan has a homer and the M’s have twenty as a team, the most in the Cactus League. I know we’re not supposed to get all hot and sweaty about spring training games, especially early spring training games. It’s a long pre-season this year because of the WBC, so these games probably mean even less than usual until the rosters begin to shrink and we begin to see more off the regulars playing. Even so, let me ask you: would you be as interested or excited if the M’s were 1-8 instead of 8-1? In addition to the homers, we’ve had a chance to see some of the young guys pitch. Thus far, Brandon Maurer, Danny Hultzen, and Taijuan Walker have looked good, while James Paxton needs to improve. Though Blake Beavan and Erasmo Ramirez have both looked good at times, it’s too early to rule out a spot on the 25 roster for at least one of the young guys. Of the guys making a comeback, John Garland looks better than Jeremy Bonderman, but it’s still early. The M’s hitters continue to strike out at a ridiculous rate and walk very little. Still some things to improve on for spring training.